The SP-11 is one of the most complex and sophisticated preamplifiers ever released, built in two full-size rack-mount boxes with triple-regulated power supplies and three or four active devices (a 6DJ8 triode, a power MOSFET and one or two JFETs) in each amplifying stage. It appeared 1985, at the mid-point of Audio Research's experiments with hybrid circuit topologies, sitting between the more-or-less traditional valve circuit of the classic SP-10 and the almost entirely solid-state SP-9 and SP-14, the latter having only a single valve (at the input of its phono stage). Many purist valve enthusiasts turn their noses up at the extravagance of the parts count, as well as the op-amp series regulators and global feedback loops. At the time it was the latest example of the trend in Audio Research preamps away from the old warm and cuddly valve sound and towards a far more neutral clarity and depth, at the same time as avoiding any of the listener fatigue associated with many solid-state components. Many of ARC's fans missed the "bloom" and warmth of the SP-8 and 10, though the SP-11 won plenty of new admirers for its most un-valve-like precision and openness. Audio Research released three phono preamps over the four or five years after the SP-11: the SP-9, the SP-15, and the SP-14. The SP-15 replaced the SP-11 at the top of the range; it was basically the same preamplifier as the SP-11, but with MOSFETs in the line stage replacing the valves of the SP-11 (though the three-valve phono stage is almost identical to that of the 11) and added balanced outputs. The 9 and 14 were less ambitious preamps in single boxes, with similar circuitry, though the more expensive 14 had more control functions. 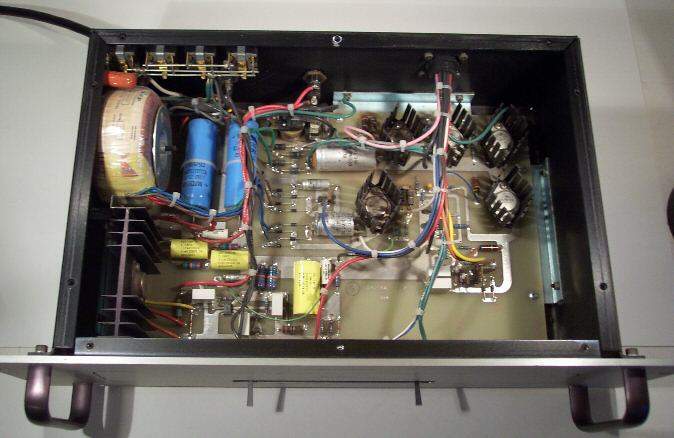 The 9 had two valves, one in each of the phono and line stages, while the 14 had only a single dual triode valve in the input of the phono stage. Here follows a summary of my understanding of how the SP-11 works, mostly gleaned from photographs and circuit diagrams from Manfred Persson's page. Before discussing the design of the various sections of the SP-11, it is instructive to contrast the SP-11 with the SP-10. These were ARC's two top-end preamps in the 1980s, and for a while both were actually on sale at the same time. The two preamps are both externally and functionally quite similar: the same two-box construction, with the main power supply housed separately, and a similar lineup of controls on the front panels, though the 10 is missing some of the 11's more exotic options, such as the variable gain and the inverted output. 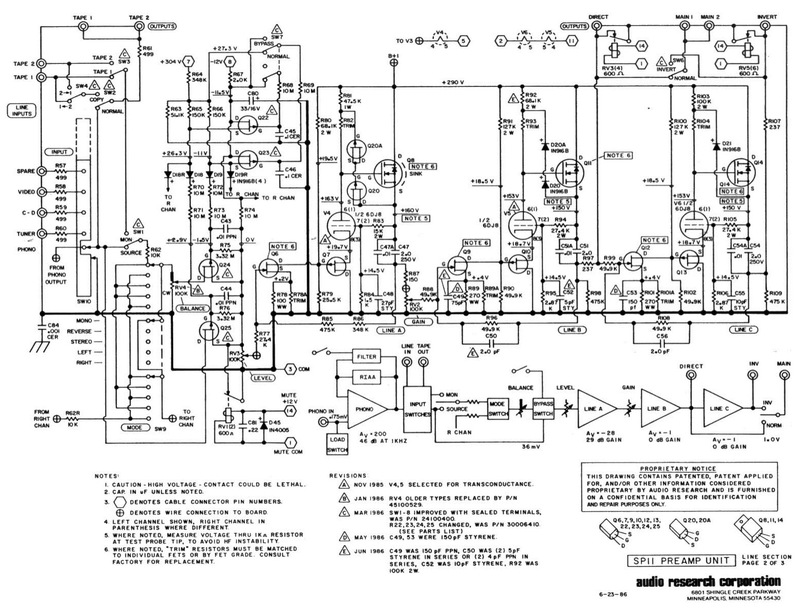 Even though the circuit blocks inside the two preamps are arranged in a similar way (for example, the phono stage in both preamps has three stages with the RIAA equalisation achieved through a global shunt feedback loop), the philosophy seems quite different - it's actually hard to believe that the active circuits were designed by the same person. The 10 seems to be a kind of ultimate homage to the concept of a valve preamp. Its circuitry is similar to that of the preceding SP-8, but with liberal doubling-up of valves to improve on gain, noise and output impedance figures, a much heftier outboard power supply, as well as giving each stage its own (solid-state) regulated supply. The SP-10 is widely loved for its presence, "musicality" and dynamics - Anthony Cordesmann describes it as "the most attention-grabbing preamp ever made. You feel like you are in the best seat in the house even as your mind tells you that the SP-10 may be improving slightly on the signal source to give you this impression." The SP-11, by contrast, was by the standards of the time extremely neutral and transparent, and in some ways a little too revealing of shortcomings in the recording or in the rest of of the audio system. It seems to be looking forwards in time both into the digital era and to the modern generation of vinyl reproduction technology, when no apologies need to be made for the frequency response and accuracy of the LP medium. There was a thread discussing the two on the Tube asylum a while ago, which generally (and not surprisingly) comes out in more favour of the 10. The major difference between the two flagship preamps is that the SP-10 uses valves exclusively, with the exception of the on-board regulation stages. The SP-11 uses a hybrid gain block, which is derived from William Johnson's patented hybrid configuration (left). The SP-11's circuit is itself a hybrid between the Johnson patented circuit, with the local feedback to the valve grid, and David Berning's hybrid concept as used in his TF-10 (right), which replaced the lower triode in a standard cascode circuit with a JFET source-follower to lower the noise (and is also claimed to reduce distortion by making use of the opposing curvature of the characteristics of valve and JFET). Each hybrid block in the SP-11 uses a triode valve as the load for a source-follower P-channel JFET in a cascode-like circuit (although in a true cascode, as described in Johnson's patent, the lower device has a high voltage gain due to the high impedance of the upper device, instead of the unity gain of the JFET here). A power MOSFET source follower is then used to lower the output impedance. The output, taken from the source of the MOSFET, is fed back to the grid of the valve via a voltage divider network which sets the gain of the stage. Note that the valve generates all the voltage gain, as the two transistors are used in unity-gain mode. Note, too, that the gain is pretty much independent of the parameters of any of the active devices, which makes part matching and valve ageing far less of a problem. This arrangement promises to combine the large overload capabilities of valves with the low noise of the JFET and low output impedance of the MOSFET, at the same time as the advantages of the low distortion and low input capacitance of the quasi-cascode circuit. The line section of the SP-11 uses this gain block with an N-channel JFET preceding it, and then encloses the whole thing within a feedback loop. I suspect the extra JFET is there to provide some additional gain. The logical progression of the ARC range from triodes to transistors continued in the phono stages of the SP-9 and SP-14, where the cascaded JFET and triode at the input (providing most of the voltage gain) are followed by a familiar gain block made up of three MOSFETs. Here Q2 (P-channel) and Q5 (N-channel) are used in source-follower mode and Q3 (N-channel) yields a further voltage gain of about 5dB. Interestingly, the Curcio Daniel II uses similar circuits to the SP-11 in both phono and line stages. The Curcio design uses a JFET with a cascoded triode, followed by a solid-state device (here a bipolar transistor in place of the ARC's power MOSFET), the latter again supplying feedback to the grid of the triode through a voltage divider. The phono stage has overall a very similar topology to that of the SP-11, with two hybrid gain blocks sandwiching an inverting stage (in this case a common-emitter transistor instead of a common-cathode valve), and a CR feedback network from output to the source of the input JFET setting the RIAA response. Curcio generally prefers bipolars to MOSFETs, citing the latter's tendency to oscillate - and chides those who dare to "upgrade" his circuits with MOSFETs! The HT line regulators are similar to (though a little simpler than) those of the SP-10 and 11 too, with an op-amp providing servo feedback for a rugged pass element. The latter is again a bipolar power transistor instead of the MOSFET in the ARCs. Joe Curcio, in fact, acknowledges the influence of the SP-10 in his thinking, and also offers upgrades for ARC preamps, particularly the SP-3. This consists of four active stages with a global feedback loop determining the RIAA equalisation, plus a switchable low-frequency warp filter. The circuit inverts overall, so those sensitive to absolute phase may want to either connect the cartridge in reverse polarity or use the "invert" output of the preamp when listening to LPs. The input stage is a fairly standard common-source JFET stage, with some compensation capacitors around it, suggesting that some kind of circuit simulator has been used in the design. If the input device were a 2SK170, which has a gm of around 20 mS, the drain (R13 and R13 in parallel=36K) and source (R3=200 ohms) loads used in the circuit would give a voltage gain of about 140 at the drain (and about 0.8 at the source). The current through the drain resistor R13 is 2.1 mA, and most of this will pass through the JFET unless the trim resistor R11A has a very low value. The second and fourth stages are each built around the hybrid JFET/valve/MOSFET block described above. The valves are run with a low-ish anode current of about 2mA, which should help reliability and longevity, while the drain current of the MOSFETs is 5mA. The first, Q3, has 200V across it so will dissipate a watt (and is fitted with an appropriate heatsink), while Q5 has 150V across it and will accordingly dissipate a slightly lower 0.75W; I can't see the latter devices on the photos of the PCBs, but heatsinks aren't specified on the circuit diagram. The third stage is a low-gain common-cathode triode stage, which simply inverts the signal so that the circuit inverts overall and the global feedback is negative in polarity. It is hardly stressed in this position, since it only has to drive the gate of Q4. The output of the final stage is fed back to the source of the input JFET through the RIAA feedback network. The 75us pair (R2 and C2) are almost correct as shown; taking C2=2400pF, the appropriate value for R2 is 31.25K, rather than the given 32.4K: this gives a time constant of 77.8us, which would lead to a probably insignificant error of less than 0.2dB in the response. However, the resistor for the 3.18ms pair is seriously adrift: the correct value should be 368.1K, while the circuit diagram shows R1=649K in series with a trimming resistor. Using R1=649K will give a boost of up to 4dB at frequencies below 100Hz, which may or may not be the intention of the designer, but adding series resistance to this will make the error even worse. It may be, of course, that such an LF boost is intended to correct an error elsewhere. The value of the 3.18ms capacitor C1 is potentially correct: the circuit shows 7800pF in parallel with a trimmer, and this would have to be 840pF to give the required value of 8640pF with R1=368.1K. I can't quite read the colour codes for R1 and R2 in the photos, but they certainly don't have the same values as on the schematic. I estimate the gain of the valve stages to be 5.7 (V1), 1.4 (V2) and 10.5 (V3), or a total of 84. 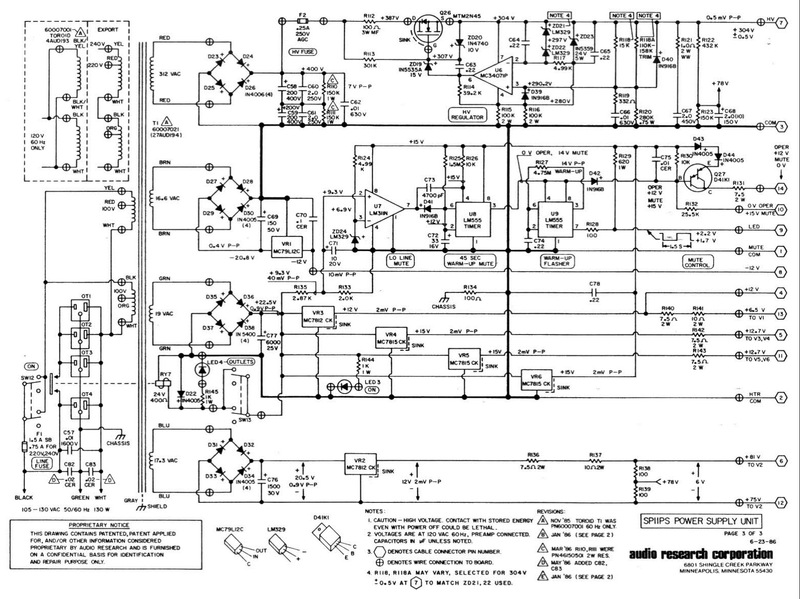 The open-loop gain of the phono circuit would then be a little over 10,000, or 80dB. The feedback loop, with R1=368.1K, requires a gain of at least 2000, or 66dB, at low frequencies, so the circuit should work as designed. The warp filter (the circuit around U5) is a second-order low-pass filter whose output is switched by a JFET and is then fed to the source of Q1, in parallel with the equalisation feedback network. This seems an odd arrangement, since when the filter is selected, it changes the load that the equalisation network sees, and hence alters the gain of the circuit at all frequencies. The approach taken by Ben Duncan in the ADEQ strikes me as more elegant; he uses an RC first-order high-pass filter with time constant around 20Hz between equalisation and output buffer sections, and the IEC switch bypasses the capacitor with a much larger one, via a reed switch. The SP-11 phono circuit, however, doesn't have a separate output buffer, since the EQ network loops globally from output to input of the circuit, so there's nowhere obvious to put such a switchable filter. The filter is described as "25Hz Hi-pass phono subsonic 6dB/octave rolloff (to eliminate ringing) with transition to 12dB/octave at 10Hz." Having separate slopes between 10Hz and 25Hz seems like a sensible approach, since there may be some musical information below 25Hz coming out of a high-quality record deck. The input load for the cartridge is switched at the front panel. This has five possible values from a very low 3 ohms to 100 ohms for moving-coil cartridges, as well as the standard MM loading of 47K. Rather than having adjustable gain in the phono stage for different cartridge outputs, the gain of the preamp is set at the "gain" control in the line section. There are many diodes throughout the preamplifier circuits which I assume are there to protect the rest of the components in the event of a valve failing, or of the preamp being powered up without one or more of the valves installed. Johnson is fond of using small-signal JFETs with the source and drain shorted together in place of some of these diodes. Since these are equivalent to a reverse-biased diode in normal operation, I don't really understand why a (much cheaper) diode isn't used instead, although Johnson might conceivably be taking advantage of the extra gate capacitance of the JFET relative to that of the diode. 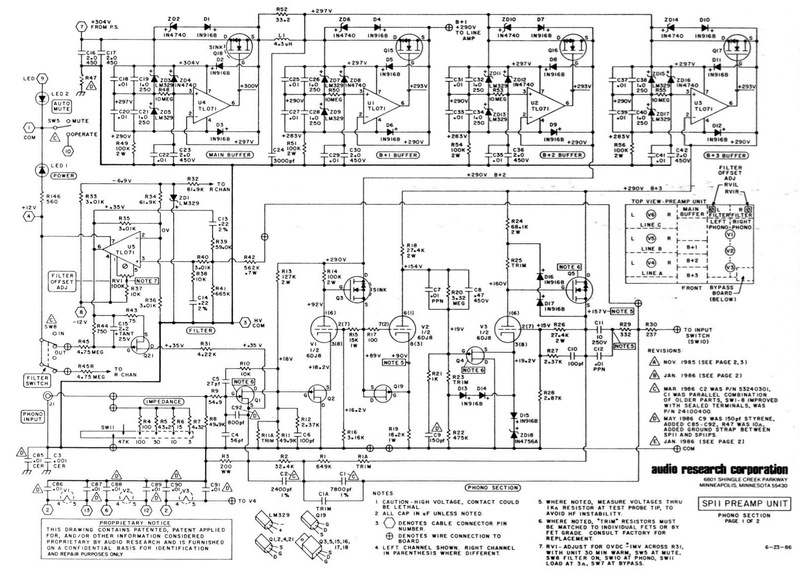 There is one thing about this preamp design that does concern me, and that is that the third valve in the phono stage (V3), as well as all three valves in the line stage, are run at anode voltages of over 130V, which is the maximum specified in the 6DJ8 datasheet. This isn't at all reassuring for the reliability of the amplifier. I wonder whether the 6922, which can be operated at over 200V, might be a more sensible choice here than the 6DJ8. The outboard power supply (see below) feeds the preamplifier with just over 300VDC through the umbilical link. 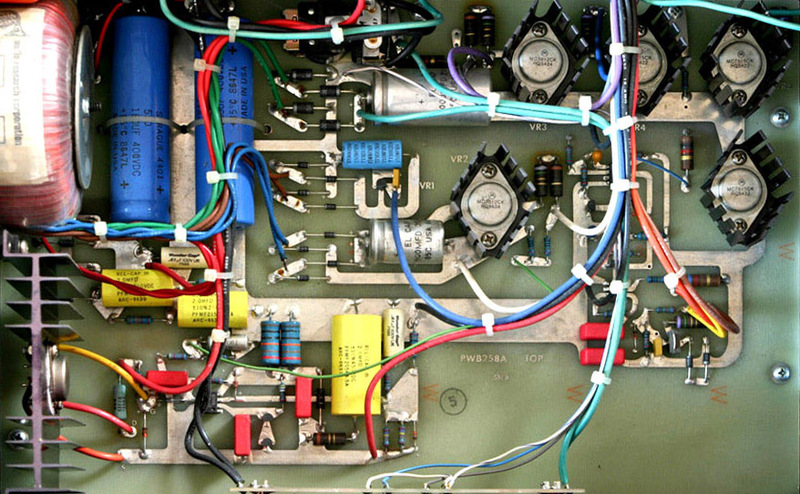 This is further regulated and filtered in the preamp box, and then three additional voltage regulators in the centre of the preamp PCB supply the line stage and the input and output stages of the phono circuit (B+1, B+2 and B+3, respectively). The four regulators are identical, and are fairly orthodox MOSFET series circuits, with an op-amp supplying the servo signal to the gate of each FET. The DC voltage drop between input and output of each of the regulators is the voltage of the LM329 voltage reference (6.9V), so if the PSU output is correctly adjusted to 304V, the HV line after two stages of regulation will be 290V. The voltage references are cleverly decoupled from the input of the op-amp with a time constant of about twenty seconds, so that any audio-band noise from the regulators isn't passed to the outputs. This also provides a slow start for the HT supplies to the signal circuits. Again, care seems to have been taken in these regulators to ensure that circuit malfunction will not damage components. For instance the diodes across the power rails of the op-amp and the zener diode between non-inverting input and +V ensure that excessive or reverse voltages are not applied to the IC. This consists of three very similar inverting gain stages, whose active elements are basically the Johnson hybrid stage. Each is preceded, as it was in the phono stage, by an N-channel JFET which provides most of the open-loop voltage gain, and there is a shunt feedback network around each stage to set the gain and lower the output impedance. The first stage is preceded by the balance and level controls, and has a gain of 17 (25dB). The "gain" pot precedes the second stage, which is a unity gain inverter. The third stage is identical to the second, and simply provides an inverted output for the preamplifier. The SP-11 has a very sophisticated and flexible control interface, although of course it dates from a time before remote control was easily feasible. The most distinctive control feature is the presence of two gain controls at the left hand side of the front panel. The leftmost one, marked "Gain" lies between the main gain stage of the preamp and the outbut buffer. The other, marked "Level", is placed between the balance potentiometer and the first gain stage, and is used to set the maximum gain of the line circuit. The Gain knob is then used as the volume control, and the preamp gain is selected with the Level control so that the preferred listening range is taken up by the whole rotation range of the Gain control. The two controls may, of course, be used the other way around, but it's handy to have the volume control knob at the end of the control panel. The extra control also allows the user to compensate for a wide range of phono cartridge output voltages without losing useful control of the listening volume . A trademark Audio Research feature is a "Mode" selector, which assigns the output between stereo channels. The options are mono, channel reverse, stereo, right-only and left-only. Never having owned a preamp with a channel reverse option, I can't see what this might be used for, but I suppose one or two recordings out there might have the channels accidentally reversed. More conventional controls include an input selector, a balance control, an output mute, a monitor/source control, and a switch which allows copying in either direction between two tape devices. A "Bypass" switch is provided, which simply removes the balance control and Mode switch from the circuit. Several reviewers have noted that the SP-11 sounds more transparent in Bypass mode. Lastly, the "Normal/Invert" switch selects output polarity, routing the output of either the second or third active stage to the "Main" output sockets. The outboard power supply This is, on first sight of either the PCB or the circuit diagram, a complex piece of electronics, but each of its several functions is executed in a relatively orthodox fashion. The SP-11 PSU is entirely solid-state, using standard silicon rectifiers and ICs for regulation and timing. In this it is in marked contrast to the PSU of the SP-10, which uses valve pass elements for the HT supply, albeit with an op-amp for servo control. The toroidal mains transformer has four secondary windings, one for the high-voltage supply and three 18V windings for filament supply and control functions. The HV rectifiers, with two large 200uF reservoir capacitors in series, are followed by a first stage of regulation, which is again based around an op-amp and series MOSFET, although there is a preset pot for adjusting the output voltage to 304V. The high-ish transformer secondary voltage, giving raw 400VDC, will give a good tolerance to mains undervoltage, though the MOSFET voltage rating will have to be 500V or more to ensure it isn't damaged by over-voltage. This MOSFET is mounted on a large heatsink and will get quite warm in use, since it drops eighty volts or so at about 150mA. The rest of the PSU circuitry is relatively unremarkable, consisting of four separate TO3 chip regulated supplies for the valve filaments, the preamp relays and the switch-on mute logic, and a couple of 555 timer circuits for the latter. The low-voltage regulation seems to have been designed for robustness, with the separate overspecified regulator ICs, possibly to deal with the low cold resistance of the filaments at turn-on. One of the filament supplies (to V2 in the phono stage) is floated to 78V to avoid high voltages between the filament and cathode of the valve. Note that the filament supplies to all the valves in the phono stage are all decoupled to ground on the preamplifier board to reduce RF and hum. There is one fundamental aspect of the design that still doesn't satisfy me intuitively. I appreciate that much work - mostly using CAD techniques - has gone into fixing the usual pitfalls of applying negative feedback around a circuit with high open-loop gain. Indeed, many well-reviewed designs are based on this approach. All the same, there is a groundswell of opinion out there that global NFB is too easy to use, and that it is generally used as a sticking-plaster to patch up the basic nonlinearities of the circuit elements. Most notable of its weaknesses are the behaviour under clipping and the tendency of high-feedback circuits to compound the order of the distortion harmonics. On top of these, high-gain circuits with loop feedback are also prone to instability with respect to awkward load impedances or signal injection at their outputs. 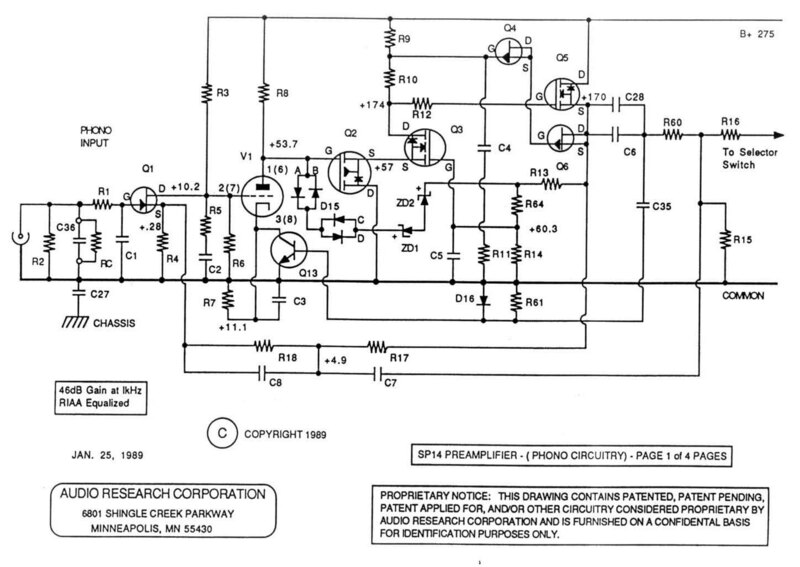 I admire very much the philosophy of Lynn Olsen's Amity power amplifier project, which uses selected triode valves (which he points out are intrinsically more linear than any semiconductor devices) in as linear as possible a circuit without any loop feedback. This would normally have the usual drawbacks of common-cathode triodes: high output impedance and high DC voltage offset between input and output. Lynn neatly sidesteps both of these simultaneously by using interstage coupling transformers instead of capacitors, but this is a very expensive solution (compounded by the exotic choice of valves in the circuit...). William Johnson's innovative circuit described above allows a large signal swing while keeping low noise and output impedance, all the time only using local feedback around a single gain device. A very fine preamplifier could have been put together around these almost ideal gain blocks without resorting to overall loop feedback, and with the additional advantage over the Amity design of doing away with the impedance matching transformers (though coupling capacitors are still needed). In the SP-11, though - and this is only my personal opinion - these are then squandered by combining them with plain ordinary common-cathode (V2) or common-source (Q6, Q9 and Q12) stages, and then looping a feedback signal around the combination to preserve linearity and set the gain. The use of a feedback loop for the RIAA equalisation in the phono stage seems redundant when such high-performance gain blocks are available. Although the SP-11 has received many very positive reviews and is often acclaimed as a classic, I wonder whether the slight tendency towards what has been described as "coldness" or "tightness" with the SP-11 (mainly in contrast to the SP-10) might be in part due to the combination of loop feedback and the solid-state devices in the circuit (particularly if there is any ringing in the MOSFETs). As the active electronic circuitry is so complex, I would be reluctant to change any small parts of it, at the risk of unbalancing such a finely honed design. All the same, some of the operational aspects are less than ideal (and some of these were, indeed, improved on in later ARC preamps). The FET switching for the selection of bypass and warp filtering is naff, and I would prefer to implement the same features with relays. This would ensure complete electronic isolation between control and signal circuits, which I strive for in my own designs, as well as avoiding any possible distortion from the FET switches. I would replace the "level" 100K dual potentiometer with a six-position switched attenuator, as indeed do ARC in the subsequent SP-14 (and in the latter it's labelled "attenuation", even though at each setting the maximum gain of the preamp is more than unity). This would give more repeatable settings. Gain increments of 6dB, as in the SP-14, should be easily fine enough. The selector switch for phono input impedance is at the front of the box. This means that wiring is required from the phono input socket on the rear panel to the selector at the front, and then back to the phono input circuit at the back of the PCB, which I consider bad practice at such low signal level. The input loading resistors on the PCB could be hard-wired, as in the SP-9 and SP-14, or resistors on plug-in DIP headers could be used as in my Audio Synthesis ADEQ phono stage, but front-panel selection of cartridge load is potentially a very useful feature (even if used only rarely!). I would put the switch near the back of the box, and then use a long extension shaft to the front panel knob. Similarly, I would place the input selection switch closer to the input phono sockets at the back, or preferably use relays, as ARC appear to have done later on with their Reference Three. Either approach would reduce cross-talk between inputs, as also would adding ground switching for inputs. Since the SP-11 provides line-level main outputs of both polarities simultaneously, I would add an XLR balanced output to increase system flexibility (as did ARC subsequently in the very similar SP-15). I don't know a priori how well matched in gain the two (near-identical) inverting output stages are, but I suspect that with precision resistors in the feedback networks and reasonably well-matched valves for V5 and V6, this should be possible to within a fraction of a dB. Some reviews of the SP-11 on the Audio Review site. Some interesting comments on ARC preamps on the Audio Asylum. Joe Curcio's Daniel II preamp, which uses similar hybrid topologies to the SP-11. Allen Wright's Vacuum State Electronics site, including several interesting hybrid preamp projects.